The water pump on the Dodge 440-3 is real easy to change. Having just replaced mine, I thought that I would share the procedure with the rest of the group. It is only a 2 hour job at most (if you omit the flush, which I would not recommend), with only 2 open-end wrenches, a small hammer or rubber mallet, and a 24-inch prybar (for tensioning the belts at the end of the job) needed. Auto Zone sells the "nosecone" for the 440 water pump (4-bolt housing nose, with shaft & impeller) for $14.99 plus 5.00 core charge. Unless your water pump housing is cracked, this is the only part you need -- Dodge designed it this way for ease of service & repair. I suggest doing a full chemical flush of the cooling system before starting the job, to clean out the entire system of rust. Drain the radiator through the petcock on the drivers side bottom of the radiator. Close up the petcock, then dump 1 bottle of Prestone "Super Flush" in followed by filling the radiator with plain water. Cap it up, then run the engine for up to 20 minutes -- run at varying speeds, up to 2000 rpm, at least 10 minutes after it is at operating temperature, though. Let the engine cool, and drain the radiator. When empty, fill with plain water & repeat the previous step to flush out the chemical & residue. After the engine cools down, drain the system again, leaving it open to work on. This stuff is non-acidic & supposedly non-toxic, but i would wash my hands well with soap & water after finishing with it anyway. It has to be at least mildly caustic in order to do what it does. After draining the final rinse water, remove the fan clutch & fan (Four 1/2-inch bolts) first. DO NOT LOOSEN THE BELTS FIRST -- use the belt tension to lock the fan hub in place, because it may take some "grunting" to break the bolts loose after twenty-something years of being in there. Loosen the alternator & power steering belts to remove the pully. The nosecone has four 9/16-inch bolts; remove the bolts, then smack it on the top of the housing lightly with a hammer or mallet to break the old gasket loose. Then just pull it out, clean the old gasket off the housing with a razor blade really well, coat the new one with high-temp red silicone gasket maker & bolt in the new one. You can do the entire job from above, while laying on the air intake cover or on a 'bench' like one of the members made. Putting the fan & belts back together is a 15 to 30 minute job -- and now would be a good time to install new belts, too. Fill with at least a 50/50 mix of ethlene glycol coolant, and your ready to go. You don't even have to remove the hoses or housing! As a suggestion to all members with the Dodge 440, I would suggest that -- if you have more than 40,000 miles of "weekly" or "monthly" use and it is still the original pump, or you are getting rust residue on the crankshaft dampener or on the ground when you park -- do the 2-hour job and change it out. If you are getting rust spots on the ground or on the dampener, then you will be changing it within days or weeks anyway; the original design had a "weep hole" in the nosecone, right under the shaft. When you get rusty residue dripping from this hole, or when you see rusty water or coolant dripping from the dampener, the shaft bearings & seals are shot and the pump is not long for this world -- ignore it at your peril! It is too cheap and simple not to change out, especially compared to what it could cost you in towing & down time -- not to mention what the mechanic would charge you to do it! "So let it be written; so let it be done!" That's good to know but, how do you know which is the right pump? How about a part number reference for the correct one? Suggestion, if your going to work on the water pump, pick up one of these foam floor mat. You can get them at Harbor Freight or any home store. Just one and place it between the fan and the rad. That way you can protect the rad from you wrench or screw driver or even the fan or water pump it's self if something slips . I had heard this before, but often wondered if it was a typo. Now, I believe it! So now I am extremely curious to actually see, visually and without question of authenticity, the impeller side of a 3780196 water pump. The quest is on... anyone got an NOS pump just lying around they can take a picture of and post? With no actual on-vehicle testing or reports to share yet, thought I'd pass along some pictures of the different impeller styles I've found available these past couple of weeks. 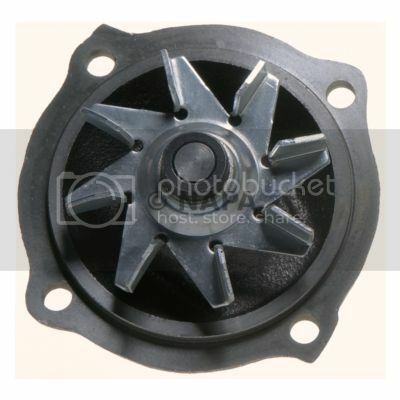 Here's the online catalog picture of the NAPA TFW 42032 water pump. Edelbrock aluminum new-impeller design, or the latest Flowkooler design. 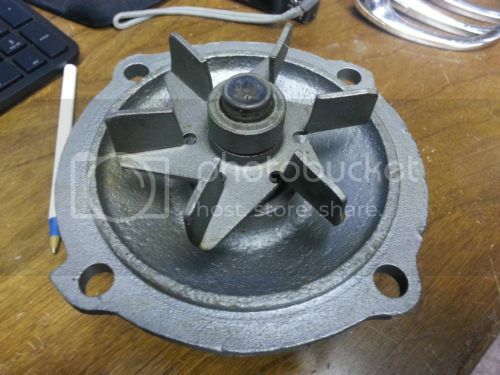 I also found this Marine Engine water pump on eBay! seen in the next set of pictures ... neither one looked like their picture. 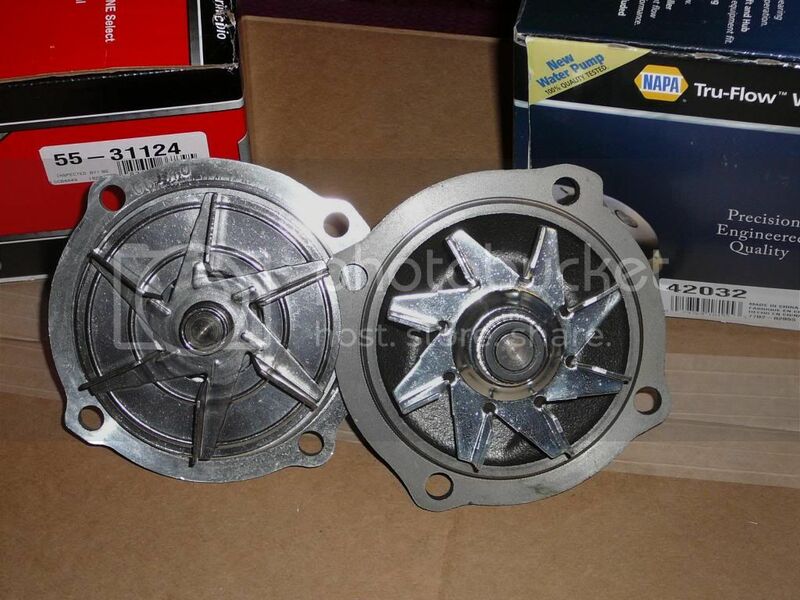 Cardone: Impeller Diameter = 4.31" Fin Length = 1.31" Fin Depth = 0.69"
NAPA: Impeller Diameter = 3.84" Fin Length = 0.88" Fin Depth = 0.63"
Thoughts or suggestions on which I should install on the 440-3 ? The NAPA one looks close to pumps 1 (http://www.dodgecharger.com/forum/index.php/topic,60599.msg718859.html#msg718859) and 6 (http://www.dodgecharger.com/forum/index.php/topic,60599.msg718871.html#msg718871) in the article I pointed to. It appears the difference between them is the blade diameter with the best performance provided by pump 1 in the RPM range we are most interested in for an RV (1000 to 3000). I do not see the low end performance I would want in those pumps that have a backing plate. If the NAPA blade diameter is the same as pump 1 I would use that one. I added the measurements of the two water pumps to the post above (right below "Picture #7"). The NAPA pump looks good with 8 vanes, but they are terribly short at 3.84" in diameter - and the vanes are awfully small... it is most likely the same as pump #6 in the FMC Test you cite. #6 was the third worst in low-rpm pumping volume, coming in behind only the abysmal flow of the 'new-style' 6-swirl pump (#2 in test, Edelbrock-type) and the small 3.51" diameter 6-vane pump (#5 in test - supposedly like the A/C version of the OEM water pumps). 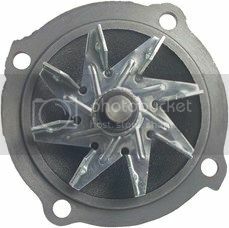 I wish I could find an 8-vane pump over 4.4" in vane diameter, like #1 in the test! I do think there is some merit to the idea of the larger diameter vanes allowing for less 'escape' of the coolant between the vanes and circumference of the housing (off the end of the vane tips). Thinking about fluid mechanics, and considering that all the top performers in the FMC Test were wide-vaned and took up most of the opening with impellers, not airspace; and considering that in aircraft it is the outer tips of the propellers that do most of the work due to their having the highest velocity, I am currently leaning toward installing the Cardone in pictures #5-#7 above - given those two choices pictured. It's still gonna be too cold here for a few more weeks, so may try to see what else I can find locally to at least take pictures of and measure. Ultimately, what goes on the Beach-Craft may depend on what I see when I take off the current thermostat & water pump. I appreciate the frustration. Short of doing a similar test they did, it is a toss up whether the 6 larger vanes/larger diameter is better than the 8 vane/ smaller diameter. I do follow your train of thought that the 6 larger vane would be better though. Yeah, I saw those and thought about it. sounds intriguing, but various reviews put me in agreement with the school of thought that those are likely better suited for short runs, not for longevity (many hours and years on the road). hey guys I know for a fact that the NAPA pump was exactly the same as the pump that I took out of my 440-3 because thats the pump I bought and I measured it and counted the empellers blades to make sure it was the same as the old one and if it went for 85,000 miles and 40 years before it leaked i am sure the new replacement will be fine. 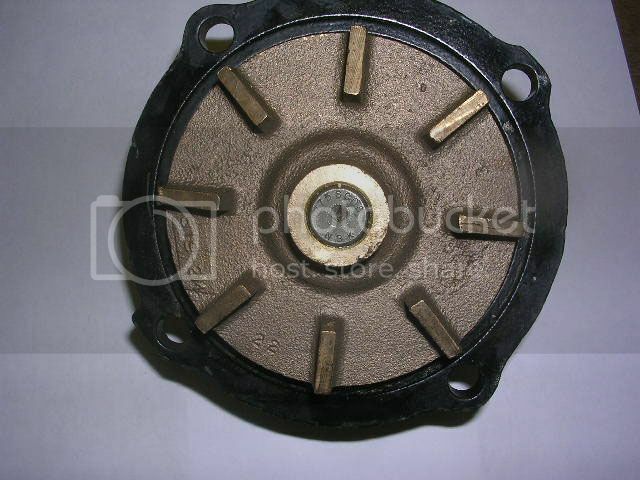 If your motor is overheating after you replace the water pump you have another problem eg. plugged rad, dirty rad fins, wrong thermostat, blown head gasket, cracked head, transmission overheating. Joe are you the original owner? cause I don't think that water pump lasted no 85000 miles and 40 years. (please correct me if im'm wrong here) I think you replaced the napa water pump with another napa water pump. which is all good cause if it worked before then it should work again. now if you start pulling a lot of weight then this could change up the equation a little. Or end up in the mountain, like your planning this summer you could run into some heat that was not expected. wow. 40 years and 85000 miles. damn good pump. ive replaced 2 napa pumps already. in 9 years. Old topic I know. But I have recently replaced my radiator which I had recored and the water pump as well. Please note that neither of the pumps you will find out at the auto part store and or napa will be the perfect correct water pump. They may work but I would not trust it based on the size of the vanes on the pump. The old one has much bigger vanes vs the pumps you can buy new. So wants your options? Have the old one rebuilt. You will pay 60 bucks but you know you are going to have the correct impeller. 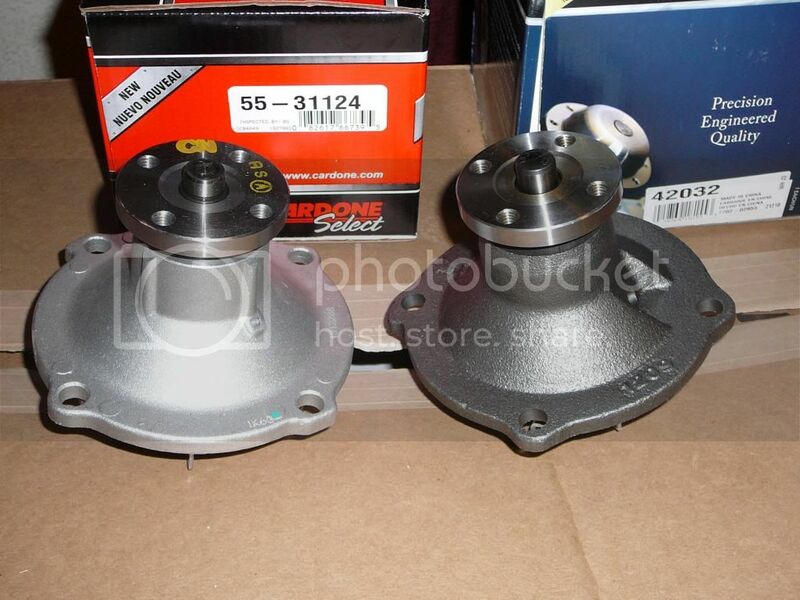 Same goes with the hydro boost and front dual piston calipers. 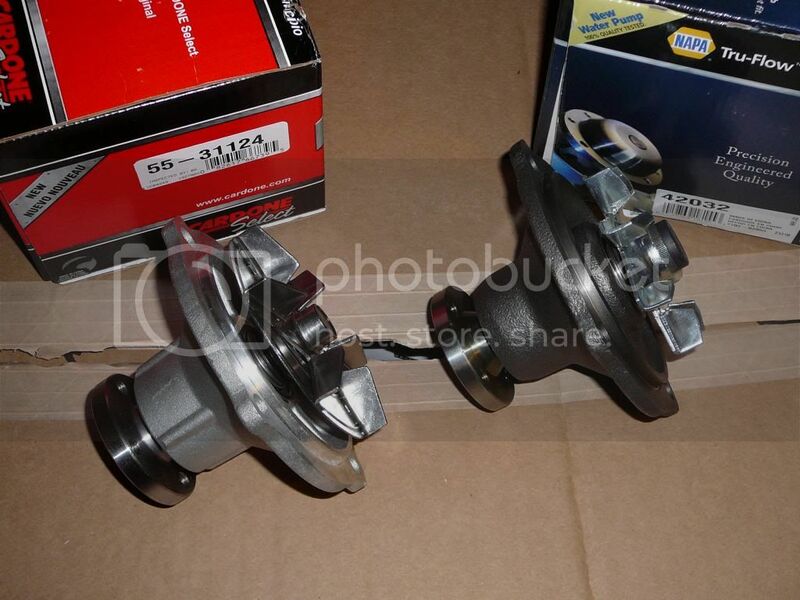 Also if you are in the market of replacing the power steering pump and hoses. You will have to have custom lines made. Napa's parts for the high pressure size will not work. Trust me. Been thought the ringer. More the once on my cruise air Georgie boy 1976 m400. Old topics don't die. They just get updated. Like our RVs. Hi everbody well we have returned from our 6 week trip across Canada from Ottawa to Vancouver down to Washington and east to NewYork State back up to Ottawa Drove 9 thousand miles . The new water pump that i installed last year worked great never got over 195 degress going though the mountains and the bad lands of Alberta and south Dakota . we had some very hot days and drove though two wild fires it was a amazing experiance and cant wait to do it again . would love to do that trip. glad you made it unscaved. Want to know what your Dodge VIN means?